Lindex Case — PinMeTo | Your customers are everywhere - are you? Lindex understood the value that Google and Google Maps bring to companies like theirs but the sheer volume of information across their stores was overwhelming to update and maintain manually. They turned to PinMeTo’s Places Manager as a solution and within the first 8 months not only had they set up each and every one of their 400+ stores on Google, they had also made over 13,000 updates to individual data fields. That’s 13,000 details like phone number, opening hours, address, or latitude and longitude that could have misled their customers. 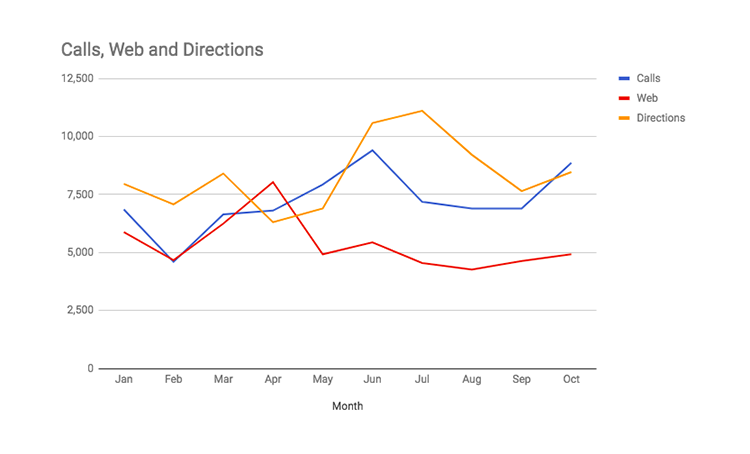 Ensuring that this vast amount of information was correct resulted in strong month on month increases in Google Maps views and Google search views. The largest increase by far was views of Lindex stores on Google Maps where views increased by 544% from 187,000 to 1,205,000 monthly views! One of the reasons for this large increase was the addition of a Google Maps section of nearby stores right in the Google search results (see figure below). Having maps locations in the search results has multiple positive effects for the company. It decreases customer support phone calls requesting information because they have already found what they need and it increases driving directions and phone calls initiated from search results (see figure below). The more times Lindex showed up in these sorts of search results, the better the opportunity that they would become the provider of choice instead of their competitors. If not properly set up on Google, they could easily lose potential customers because they either didn’t show up in these indirect searches, or the information provided in the search results was incorrect. Due to Lindex decision to take control of their business information they are now benefiting from 5.5 times as much exposure from Google searches. Not only that, but they now have confidence that the views that are being generated are giving their customers all the information they need to make their way to a local store and make a purchase.